Had a late breakfast this morning, the hot items options today were egg pattys, and biscuits and gravy, the cut honeydew and cantaloupe changed to canned mixed fruit, with the rest being the same. Sonesta ES Suites was our hotel in Auburn Hills, Michigan and I would rank it as roughly equal to Hyatt Place which is just down the street. I prefer Sonesta ES Suites due to the layout of the living space and the small kitchen area that is available is nice for people who want to make them own meals or snacks (includes a full size fridge, microwave, two burner induction stove top, pots, pans, cutlery, basically most basic kitchen items). If you come during the week (Tuesday - Thursday), there are happy hours where you get free snacks and drinks and you can mingle with other guests which unfortunately is not available during Thanksgiving. We headed to Best Buy this morning in hopes of finding the Motorola E which is only $10 USD and the Z222 for Allison's mom which is an older style flip phone but it was only $7.50 USD! We found the Z222 at the first Best Buy but had no luck with the Motorola E at the two Best Buys that we visited this morning. We also stopped by a DSW but didn't find anything there. After that, we started our drive back to Toronto. Got to the border at around 12:20pm and was done in about 30 minutes. We had no issues but instead of asking how much we spent, the lady asked us what was the damage which was funny to us. On our way back, we headed to two Real Canadian Superstores because I was hoping to get the PlayStation 4 bundle since it was no tax this weekend but failed, but we ended up getting two hot dogs and a pop at the local charity BBQ there. 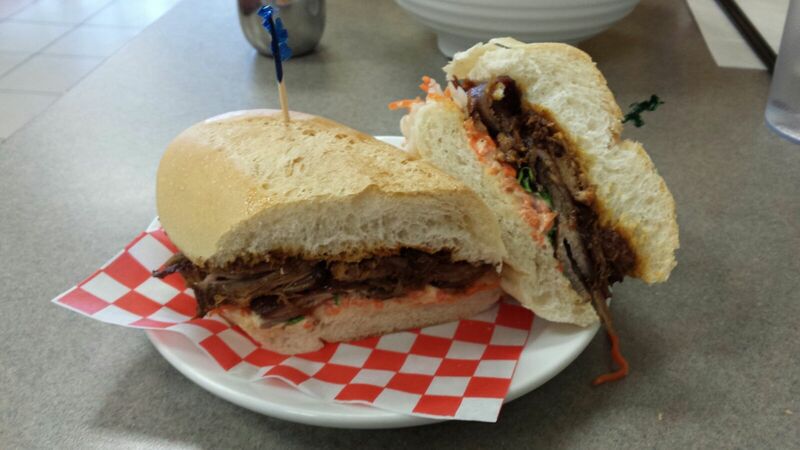 For lunch we stopped at Banh Mi Shop and surprisingly, the food we thought was pretty good. Initially we had concerns since it is ethnic food in a relatively white area and we joked that if this place wasn't good, we would have to eat it again but in Toronto. I ordered grilled pork vermicelli ($8.50 CAD) and Allison got the 3 lil pigs banh mi ($6.50 CAD) and both were good sizes and well priced. 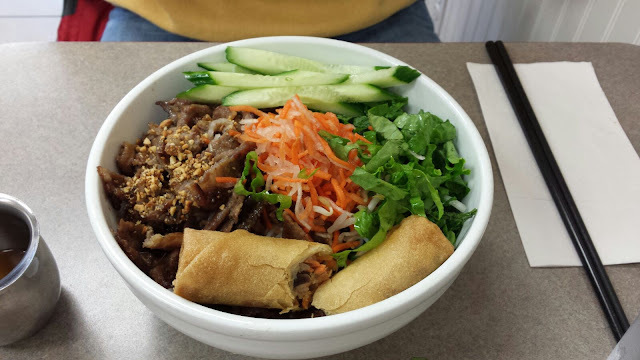 With the banh mi option, you can add a mini pho for $3.75 CAD or add fries and pop for $4.25 CAD. Note that this place is debit/cash only. 3 lil pigs banh mi. After lunch we stopped at the Toronto Premium Outlet to see what was available and we arrived at around 5:00pm and the line ups at some of the shops were insane (1 hour wait at Kate Spade). We finished in under an hour but I did end up with a pair of shoes from Columbia for only $34+tax which are similar to ones that I got last year, but slightly more expensive. With Toronto Premium Outlet finished, we headed back to Allison's place and ate our leftover pasta dishes (my spaghetti and meatball dish from Olive Garden and her raviolis from Tiffany's) and called it a night. Come back tomorrow for a summary of our Black Friday trip.